Robert Woods is the human version of an ice cream sandwich - severely underrated. I mean, really, when people discuss best desserts they never mention ice cream sandwiches. But can anyone deny that it is a classic? A staple in the dessert world? A spectacular, if not unexciting, option? Robert Woods is the ice cream sandwich of NFL WRs. Last season, many in the industry did not want to believe in his hype and were promptly proven wrong. Now, a year later, we’re going through the same charade. Let’s not make this tougher than it should be - Robert Woods is a rock-solid, high-end WR2. The excuses come pouring out when others discuss the success of Robert Woods, with words of praise lagging behind. It seems that the world wants to quickly forget that he was, once upon a time, the 41st overall pick of the NFL draft. His detractors would rather focus on his lack of success early in his career (as if the Bills are known for getting the most out of their WRs). Okay, enough about the past. This article is supposed to persuade you that the Robert Woods of TODAY is being severely disrespected in fantasy football circles. 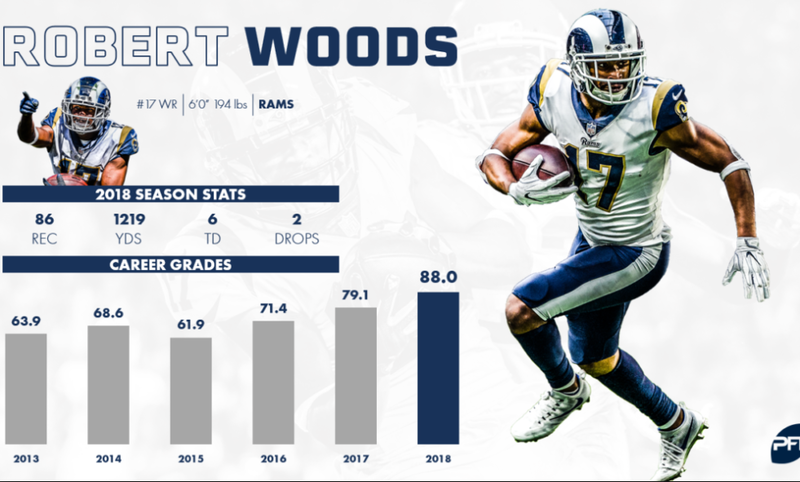 Since he signed with the Rams and became their de facto WR1, Woods has consistently improved. His 2017 season stats won’t jump off the page at you, but that’s not surprising considering he only played 12 games. Extrapolated for a 16-game season, Woods would have ended with 75 receptions, 1,041 yards, and 6.7 TDs. That, ladies and gentleman, is what you call a WR2. His 2018 season showed even more improvement. Woods came away with 86 receptions, 1,219 yards, and 6 TDs (He also added 157 yards and a TD on the ground, but I won’t even get into that now). Look closer and you’ll see that there aren’t many flaws in his game. He’s solid whether on the road or at home, he produces no matter the quarter, down, or distance to go, and is trusted by Goff whether he’s coming out from shotgun or under center. Woods’ consistency should be lauded and a lot of this is due to his head coach, Sean McVay’s usage of him. It’s becoming common knowledge now that using a WR in the slot maximizes their match-up potential. According to Rotowire, Woods ran 62.4% of his routes from the slot - keeping him away from the premier cornerback on most teams. This also allowed him to move around the formation 37.6% of the time, forcing teams to consistently keep their eye on where Woods would and could end up before a snap. That movement around the LOS is something that offers a distinct advantage for his real-life and fantasy production. Now that we all, hopefully, understand that Woods is a good football player playing in a system that maximizes his potential, lets move on to the common argument against Woods - Cooper Kupp is coming back from injury next season. This is a weak argument with no standing and the numbers will agree. Robert Woods was BETTER when Cooper Kupp was active last season. I repeat, Robert Woods was BETTER when Cooper Kupp was active last season. In case you need more convincing, you can take a look at the True Throw Values and True Target Values tabs on our website. Jared Goff was the 7th best QB on a per-throw fantasy points basis last season according to True Throw Value. Take a look at True Target Values and you’ll see that Robert Woods checked in as the 12th overall WR. Robert Woods isn’t going anywhere. Draft him, keep him in your lineup every week, and enjoy an ice cream sandwich. Newer PostTimeout! Why do all coaches make this mistake?